The natural forces at work on planet Earth have been an integral part of life since the dawn of mankind. The impacts of hazards of natural origin can range from affecting infrastructure, personal possessions, and ecosystems to negatively affecting individuals’ psychosocial wellbeing. Disasters are the aftermath of hazards caused by natural phenomena, set off by shifts in tectonic plates or atmospheric interactions in populated areas. The extant literature offers a variety of ways to classify natural hazards. For example, they can be categorized by their origin – geological, hydrometeorological or biophysical; by their nature and speed – permanent, ephemeral or episodic; or on the basis of their size or scale – large, medium or small. 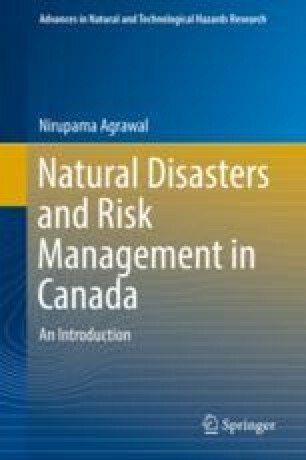 Adopting the last of the three classification schemes, this chapter presents large scale hazards, which are more likely to occur on the North American continent, in alphabetical order. The list of hazards includes biophysical hazards, droughts, earthquakes, extreme weather, floods, forest fires, ice storms and hurricanes. To help readers follow the material, the chapter draws heavily on recent examples. Young J (2013) The Toronto flood of 2013: actions from the past, a warning for the new normal? http://activehistory.ca/2013/07/the-toronto-flood-of-2013-decisions-of-the-past-a-warning-for-the-new-normal/. Accessed 21 Mar 2016.